Ok, so one person’s ‘banger’ may be another person’s cue to stick their fingers in their ears, music is subject to taste after all, but when comedians do rap songs, it’s always worth a watch. And so we come to Adam Sandler, who has a new Netflix comedy special called 100% Fresh following years away from the stand-up scene. More recently, the 52-year-old has been concentrating on both comedic and more serious acting, such as 2017’s, The Meyerowitz Stories and this year’s, The Week Of. Sandler’s turn on the stage, then, is a welcome return to a format we haven’t seen him undertake for many years. His last comedy album was Shhh… Don’t Tell in 2004, while in the ’90s, he released some musical comedy classics like 1993’s They’re All Gonna Laugh At You! and 1996’s What the Hell Happened to Me? Of course, anyone who’s seen Sandler in one of his most iconic roles in The Wedding Singer will know the guy has some decent musical chops, to say the least. And his new tune, taken from the afore mentioned Netflix special, might just be up there. 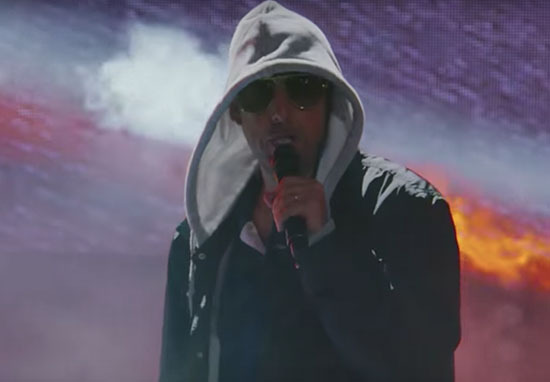 Taking us through what many people do when they leave the house, Sandler raps mainly about his phone, wallet and keys on the new song called – yep – Phone, Wallet, Keys. The everyday routine is analysed and scrutinised by the comedian, transforming into a rap song of sorts, complete with hoodie and shades, with lines such as ‘I’m heading out and all I’m taking with me is my phone, wallet, keys, yeah, phone, wallet, keys,’. Need my phone, wallet, keys. Now, before you say it’s a simple song with simple lyrics, let’s do some digging. Although it may seem like he’s literally just rapping about a very dull, routine and everyday occurrence for many people, it could be argued Sandler is really getting at something deeper here. Those three items could be seen to represent more than they suggest. The phone, for example, represents communication, interaction with the outside world, staying in touch with those around you and making sure you, too, are able to be contacted. Sandler here is suggesting he’s reachable, open and ready to talk, as all people should be. The wallet, meanwhile, represents financial freedom. Many rap songs these days willingly show off and brag about the rapper’s wealth. As a man who’s reportedly made $50.5 million in his career, it’s fair to say his wallet is as much a symbol as it is a vessel for money. And finally, his keys. Here, Sandler is implying, despite his willingness to communicate, his substantial wealth, and his readiness to leave the house – thereby fleeing the comfort and safety of his own home both physically and spiritually – he is always ready to return to his home and his family, by far the most important things to him. Or am I reading into this too much?